Not that you ever need an excuse to show off your dessert skills, but the holiday season is a perfect time to do so. More than likely you’ll be entertaining at some point, and will also have a little more time to put together something really special. 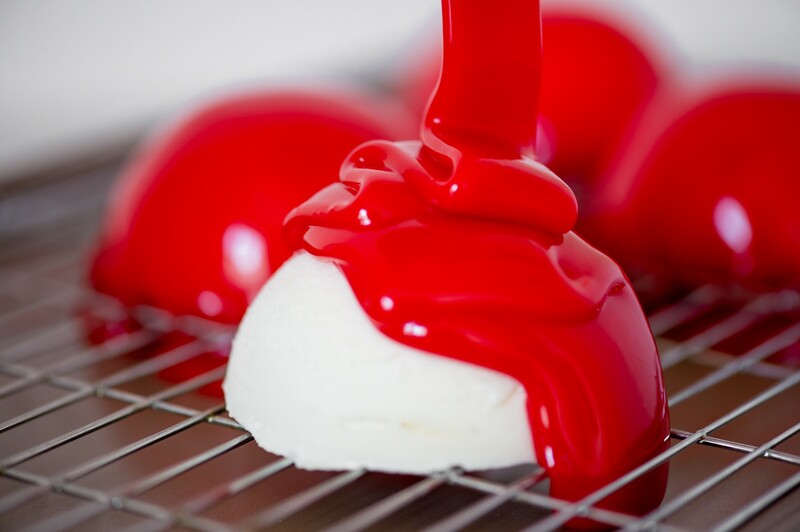 Like these gorgeous White Chocolate Mousse domes with a shiny red mirror glaze! If you watch Masterchef, Zumbo’s Just Desserts or the Great British Bake-off, you will know that entremets are all the rage. 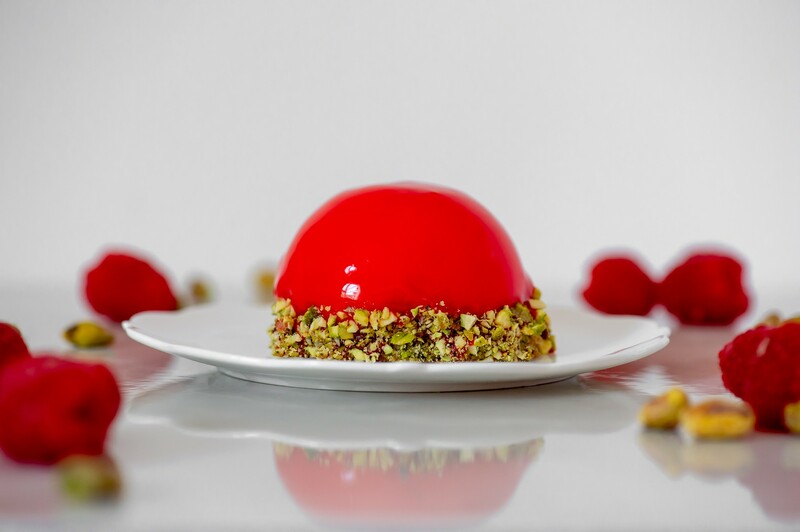 An entremet is basically a layered dessert consisting of mostly mousse and finished with a mirror glaze. Being an avid viewer of all of the afore-mentioned shows, I was inspired to make my own version of this trendy treat. Not only do these little delights possess the wow-factor, they taste divine thanks to the variety of flavours and textures in every bite. In this case, white chocolate, raspberry and pistachio but you could use different chocolate, nuts and fruits as you please! My goal in sharing recipes like this is not too intimidate you, but to show you how easy it is to pull off a showstopper dessert. Yes, there are 4 elements to it, but each one is really simple to make and all can be made in advance! The only slightly tricky element is the mirror glaze, and that’s only because you need to be fairly exact with your temperatures. With any mirror glaze you want your mousse or cake to be completely frozen and your glaze to be around 30°C when you pour it. Any warmer and the glaze will be too thin and possibly melt the mousse underneath. Any cooler and your glaze will be too thick and gloopy to give a smooth finish. Just a note on gelatine: I worked with gelatine sheets in this recipe (available at Woolworths) but you can also use the powdered version. Simply use the equivalent weight in grams (indicated in the recipe). Instead of soaking as you would gelatine sheets, you will need to “sponge” the gelatine powder in a small amount of water and warm it to melt before adding to your remaining ingredients. To make the pistachio sponge, preheat the oven to 170°C and line a large baking sheet with greaseproof paper. Cream together the butter and sugar until light and fluffy. Add in the eggs one at a time and beat well. Stir the ground nuts and flour together, then fold into the creamed mixture. Spread the mixture evenly onto the lined baking tray and bake for 20 minutes. As soon as you remove the tray from the oven, use a 7cm cookie cutter to cut out rounds of sponge. Leave to cool on the tray for 10 minutes before placing onto a cooling rack. Allow to cool completely then store in an airtight container for up to 3 days. Next, make the white chocolate mousse. Place the milk and white chocolate into a heatproof bowl over a pan of simmering water. Stir until melted and completely smooth. Soak the gelatin sheets in the water for 5 minutes (ensure they are covered, add more water as neccessary). Squeeze out all excess water, then add the gelatin to the warm chocolate and milk mixture and stir until smooth. Set aside to cool to room temperature. Whip the cream to soft peak stage. Gently fold the chocolate mixture into the cream until the mixture is uniform. Fill a piping bag with the mousse. Pipe the mixture into 7cm diameter semi-sphere moulds. Refrigerate for 3 hours or until set. To make the raspberry gel, place the raspberries, sugar and water into a small saucepan. Place on a low heat and gently bring to the boil, stirring frequently. Meanwhile, soak the gelatin sheets in the remaining 100ml water. As soon as the raspberry mixture starts to bubble, remove from the heat. Allow to cool slightly, then use a stick blender to make a puree. Squeeze the excess water from the gelatin then stir into the warm raspberry liquid. Stir until smooth. Pass the mixture through a fine sieve into a jug to remove the seeds. Pour the raspberry liquid into 4cm semi-sphere moulds and freeze for 1 hour or until set. To make the mirror glaze, soak the gelatin in the 150ml water and set aside. Place the liquid glucose, sugar and 70ml water into a small saucepan. Heat on low heat until the sugar is dissolved, stirring occasionally. Use a wet pastry brush to brush any sugar crystals down the sides of the pan. Once the sugar has dissolved, increase the heat and bring the mixture to a boil. Continue heating until the mixture reaches 104°C. Remove from heat then stir in the condensed milk and a generous amount of food colouring. Squeeze out the excess water from the gelatine leaves then add them to the sugar mixture and stir until smooth. Pour this warm mixture over the chopped white chocolate and leave to stand for a few minutes. Stir until the chocolate is completely melted and you have a smooth and uniform mixture. Set aside to cool. The mirror glaze can be refrigerated for up to 5 days. To assemble: Once the raspberry gels have frozen, scoop a small amount (about 2 teaspoons) from the centre out of each semi-sphere of white chocolate mousse and push the raspberry gel into the hollow. Place into the freezer for 2-3 hours until frozen solid. The mousse domes can be frozen for up to 2 weeks. On the day of serving, gently unmould the frozen mousse domes onto a cooling rack set over a baking tray. This is to catch the excess glaze. Ensure the mirror glaze is at 28-31°C (if necessary, place into a bowl of warm water). Pass it through a sieve into a jug to remove any air bubbles. Pour the mirror glaze generously over each dome, ensuring all parts are completely covered. The excess glaze can be scraped off the tray into a jug and reused. Place rounds of pistachio sponge onto a board. 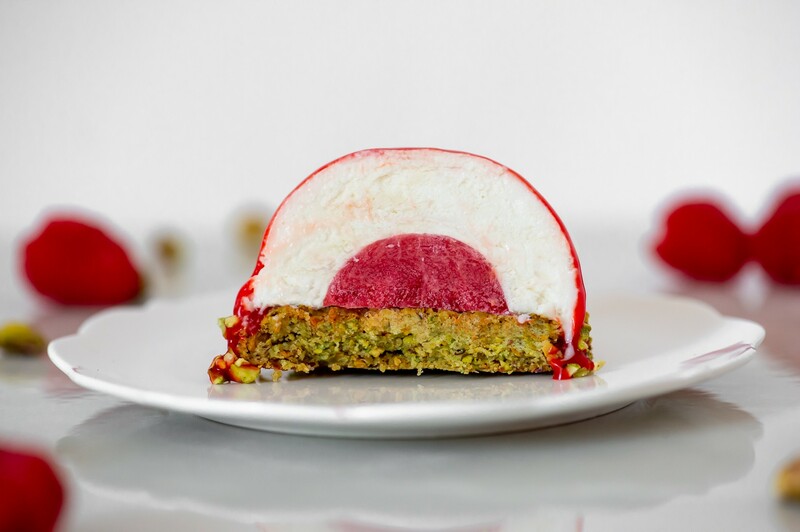 As soon the glaze has finished dripping, insert a toothpick into either side of the dome and carefully lift and transfer onto a round of pistachio sponge. Take teaspoons of chopped pistachios and press into the bottom of each dome to hide any imperfections or drips of glaze. Transfer to serving plates and refrigerate until ready to serve.